Megan Anna Rapinoe was born on the 5th July 1985, in Redding, California USA. She is a professional soccer player, a member of the Seattle Reign FC in the National Women’s Soccer League as well as the USA women’s national soccer team, playing in the position of attacking midfielder or winger. Rapinoe has been playing in the national team since 2003 and in the club since 2009. How much is the net worth of Megan Rapinoe? It has been reported that the overall size of her wealth is as much as $2 million, as of the data given in mid-2016, earned mostly from playing soccer. To begin with, Rapinoe was educated at Elk Grove Pride, and played in the Women’s Premier Soccer League from 2002 to 2005, scoring 25 goals for the team. From 2004 to 2008, she played for the University of Portland’s team the Portland Pilots, and the team won the championship of the conference in 2004, 2005, 2007, 2008, and the national championship of the NCAA in 2005. Concerning her professional career, Rapinoe was the second player selected by the Chicago Red Stars in the Women’s Professional Soccer League Draft 2009, and played the 2009 and 2010 seasons with the Red Stars. In the 2010-2011 off-season, the Red Stars owners announced that the team would not play in the WPS because of financial reasons, and instead play in the Women’s Premier Soccer League (WPSL). Rapinoe was then recruited by Philadelphia Independence, but in the 2011 season, she was exchanged, and also moved to Australia to play for Sydney FC. After the suspension of activities of the Women’s Professional Soccer in the beginning of 2012, she signed with the Seattle Sounders Women. In 2013, she joined Olympique Lyonnais for a period of six months, and then she joined the Seattle Reign FC. Regarding her career in the national team, Rapinoe made her first appearance for her country at under 19 level, playing 21 matches and scoring nine goals, with her most notable appearances being in the women’s World Cup under 20 years in 2004. Rapinoe played her first game for the senior national team of the USA in a match against Ireland in the middle of 2006. She scored the first (and the second) goal with the team against the Chinese national team on the 1st October 2006, but then didn’t play for the national team in 2007 and 2008 due to a serious ligament injury. She was the part of the American team which finished runners-up in the 2011 World Cup behind Japan, and then in the gold medal team at the Summer Olympics in 2012 this time defeating Japan in the final. In 2013, she and the team won the Algarve Cup, beating Germany (2-0) in the final – Megan was elected the best player of the tournament. In 2015, she alongside the national team won the World Cup, again defeating Japan in the final. 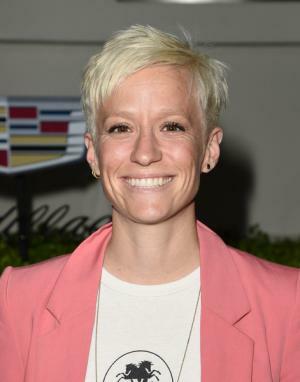 Moreover, Megan Rapinoe has made a lot of appearances in popular culture. She has been featured in the magazines “Sports Illustrated”, “Curve”, “Out”, “The Body Issue” and others. Megan has participated in many television shows, including “Good Morning America”, “The Rachel Maddow Show”, “The Today Show”, “The Daily Show with Jon Stewart” and others. Finally, in the personal life of the professional soccer player, she revealed herself to be a lesbian in 2012. From 2009 to 2013, she was in relationship with professional soccer player Sarah Walsh, since when she has been dating the artist Sera Cahoone, and the two became engaged in 2015.